Children play in the snow during the Starry, Snowy, Southwest Night event at Davis-Monthan Air Force Base, Ariz., Dec. 3, 2015. 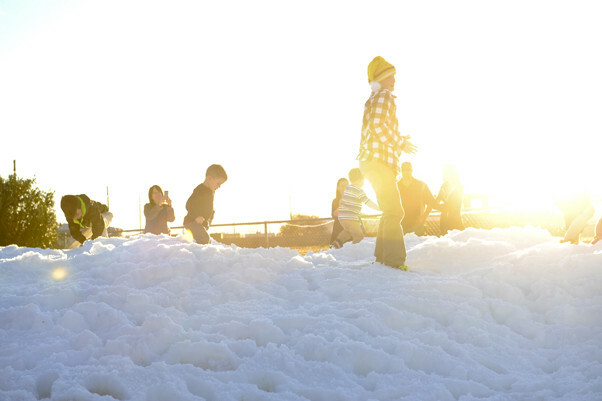 Sixty tons of snow were made for the event and divided into two areas for different age groups. DAVIS-MONTHAN AIR FORCE BASE, Ariz. — A free family event was held at Bama Park Dec. 3. 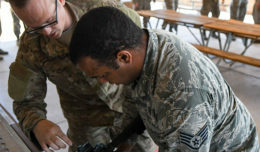 The annual “Starry, Snowy, Southwest Night” was organized by the 355th Force Support Squadron and Outdoor Recreation with approximately 30 volunteer Airmen assisting during the event. Sixty tons of snow were split into two areas for people of all ages to play in and an ice rink was set up for skating. Other festivities included photos with Santa, story time with Buddy the Elf, a mechanical snowboard, arts and crafts and much more. Free hot chocolate and cookies were provided. U.S. Air Force Col. James Meger, 355th Fighter Wing commander, welcomed everyone at the event, then introduced Santa Claus during a tree lighting ceremony. Santa invited children of deployed Airmen to assist him in lighting the base tree of lights. 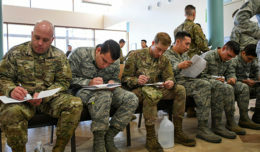 Approximately 2,000 Desert Lightning Team members and families attended the holiday festivities.